The campaign I’ve loved watching roll out in 2018 is Maggi Kitchen Journeys. 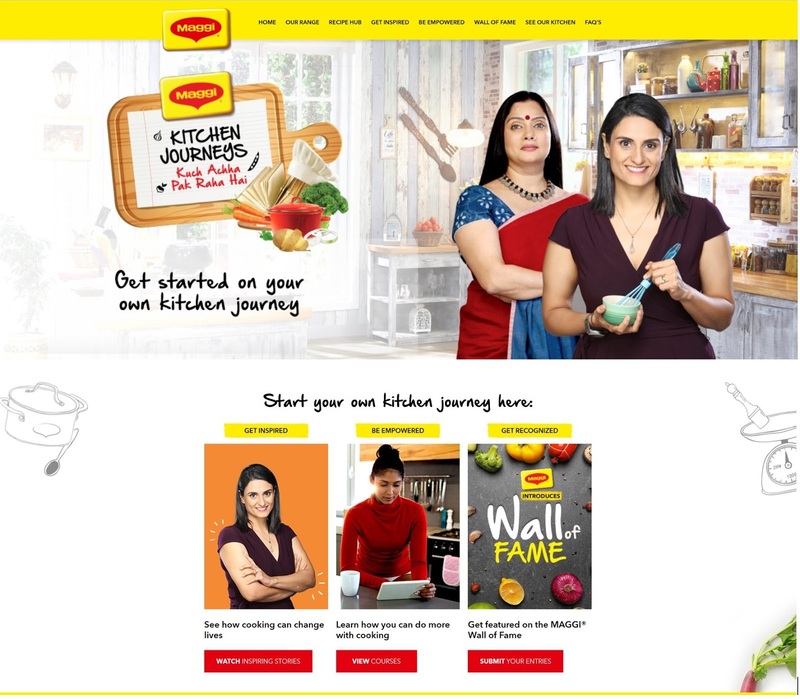 Nestlé partnered with Zee Network earlier this year to come up inspiring stories of women across India who made a difference to their lives (and those around them) with cooking. The thing about focusing on relevant and quality branded content is that you can devise an integrated media strategy to take the brand thematic to the customer as a next step, because it is content and good storytelling that resonates. Good content usually works across the board. In this case Nestlé leveraged TV, social media and the ubiquitous YouTube. The series started mid-July and ended a couple of months back, but all the videos are available on YouTube to watch. Unfortunately, they haven’t created a YouTube playlist for the series (definitely something to consider) but check out the 12th episode here . The theme of the series was #kuchacchapakrahahai (something good is cooking), which does a great job of summarizing morale boosting stories the series brought together. The episodes celebrated women who brought their dreams to reality through sheer hard work and cooking skills. The production values are great including the choice of host, the ever ebullient, Renuka Shahane. The format is predominantly Q&A interspersed with recreating stories in a fictional format, followed by the guest cooking- with the inevitable Maggi masala plug. I must say that the format is engaging, and the life stories of the women are uplifting. A complete win from a content perspective. In addition to videos, the Maggi website takes the campaign a step further with learning courses that can help anyone take the first step to building their own food business. There is also a Maggi Wall of Fame where participants can share food recipes and ambitions to get featured. Surprised I haven’t seen a social media version of this, could have been a great Instagram concept in my opinion! Pantene’s new #GreatHairDay14 Day Challenge is a social media campaign designed for women to share their feel good stories. The core idea being that a great hair day is not just about healthy hair, it is about feeling better and more confident. These 14 Day Challenge results are giving us all the feels 🙌 Share yours with us tagging #GreatHairDay & @pantene for a surprise! The campaign microsite has a nifty Hair Advisor tool where you can provide details on your hair routine, goals and challenges and it analyzes the input and provides a hair routine recommendation that fits your lifestyle and styling needs. 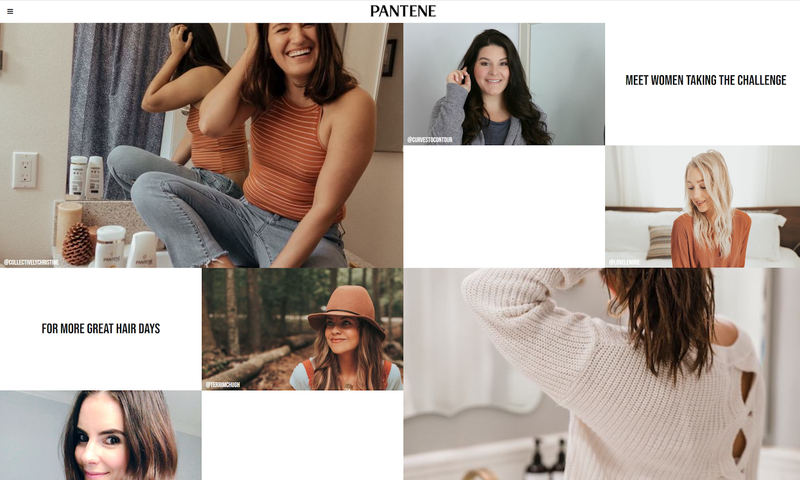 Pantene has enlisted bloggers and social media influencers for this campaign - which is a de rigueur for most brands today. Social Media influencer posts are a part of the “wall of fame” – which includes pictures of women taking the challenge and tagging their pictures on social media with #greathairday and #pantene14daychallenge. I have to say that this is a well put together initiative to drive social media buzz and generate user stories. Instagram has been the chosen platform for international fashion brands to showcase their latest campaigns and collections. With an increasing worldwide user base, younger demographic profile, advent of ‘influencers’ and new product innovations that support unique creative solutions and integrated digital commerce, Instagram has emerged as the ideal social platform for the fashion & retail industry to reach their audience. In India, Sabyasachi and Masaba are the two designers/brands that have jumped on the bandwagon and have leveraged the platform well. I have followed both these pages for a while and in my opinion, they do the best work. 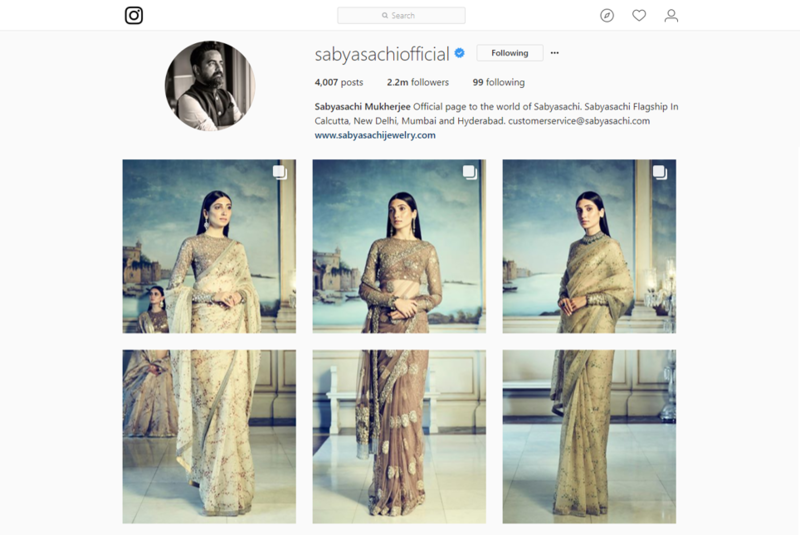 Sabyasachi’s page on Instagram is a fashion lover’s delight with breathtaking photography, thoughtfully curated content and amazing attention to detail. Sabyasachi has launched his collections on Instagram since last year and his #BridesofSabyasachi campaign is quite popular owing to well thought out celebrity endorsements and his work with a leading TV channel. The rich imagery of his collections combined with storytelling have been a winning combination. 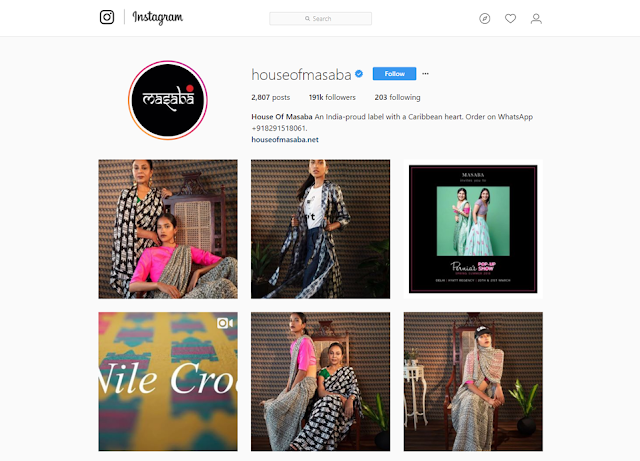 Masaba, on the other hand, has been quite a pioneer and early adopter of Instagram for her brand ‘House of Masaba’. I still remember her much talked about Candy collection launch on Instagram during the 2015 Lakme India Fashion Week. It was India’s first ever ‘Instagram only’ fashion show. She launched her 2018 Summer collection on Instagram back in March this year which was all about great imagery and savvy storytelling. Part of the collection is modeled by real women from across the country, their personalities shining through in every photograph, which makes the campaign relatable. 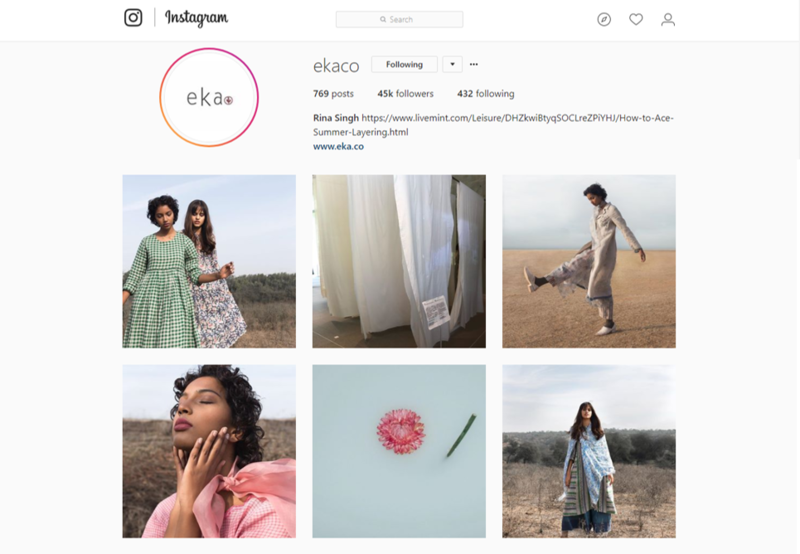 Special mention to EKA for sticking to their brand of minimalism and doing such a great job with their well curated eclectic imagery on Instagram. It does seem like the trend is catching up and hopefully we will have more Indian fashion brands taking their social media presence seriously. Oriflame launched its new Optimals range with Swedish natural ingredients that provides a tailored solution to specific skincare needs. The brand video is beautifully shot. Check it out on their Beauty Diaries microsite here. 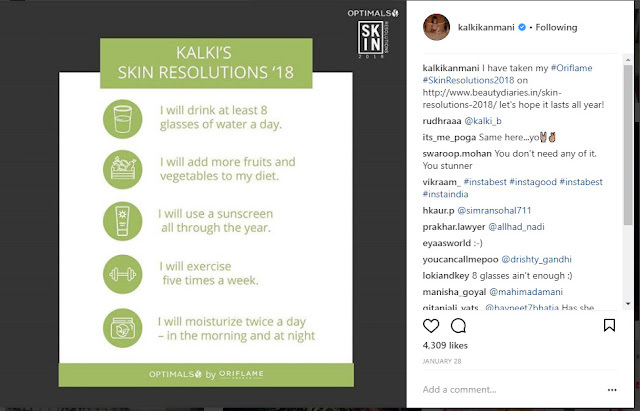 As a part of the launch, Oriflame set up a social campaign in January to get users to take their #SkinResolutions2018 with a chance to win the new Optimals products all through January. Users needed to select from a list of resolutions and generate a personalized skin resolution image that they could share on social media. Social media posts from their brand endorser Kalki Koechlin was a great tactic that helped accelerate the campaign and provide visibility. 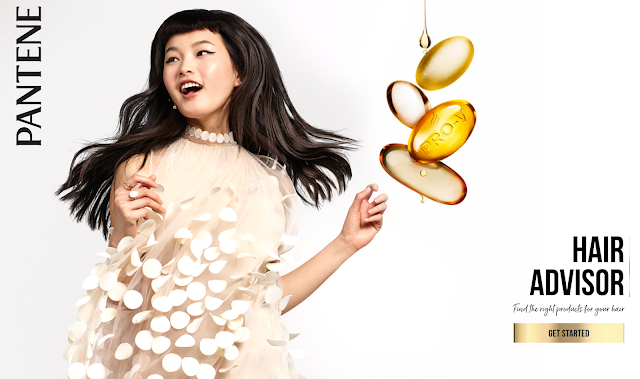 Considering Oriflame is a multi-level marketing company, social media and digital campaigns like this are a great tool to increase footprint and generate leads.